MADRID: Grim-looking Spaniards clutching beers in Madrid bars grasped for explanations Thursday as their heroes crashed out of the World Cup in the group stages, beaten 2-0 by Chile. "What do I think? Sadness. And I think they didn't play at all. I think they were tired," said Joaquin Lamas, 34, a salesman, who had painted his face in the Spain colours and donned a red Spain shirt ready for a victory party. "It is a surprise. I was not expecting it. I thought we would get to the final. I was hoping to celebrate today," he said as half a dozen customers nursed drinks and glared glumly at a television in the city centre's Taberna del Gijon bar. 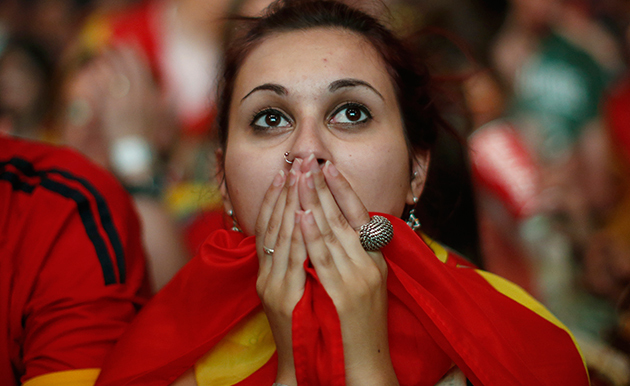 "From the fifth minute I knew Spain was not going to do anything," he complained. "Bad, bad, very bad. I am too sad to say anything good," he said. 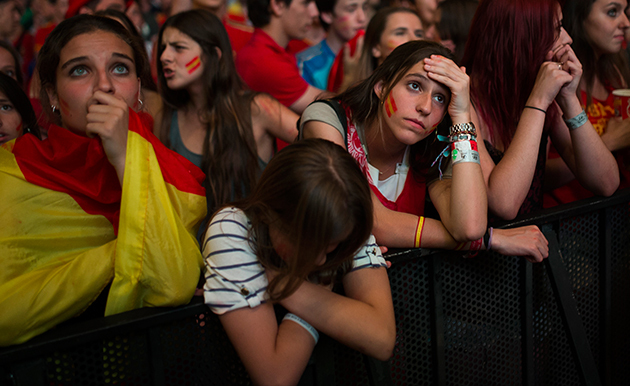 Spain's sporting press reflected the mood. "World failure" headlined the online edition of conservative daily El Mundo, as the defeat of the Roja relegated the story of King Felipe VI's ascension to the throne to second place. "Failed!" echoed Spain's biggest-selling sports daily Marca after Chile's Eduardo Vargas and Charles Aranguiz administered the killer blows to Spain's World Cup dreams. "A sad farewell to the champions of the world," the paper said. 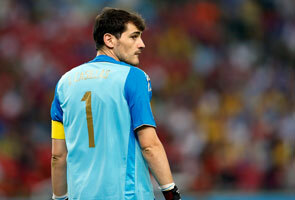 "Spain once again gave a very poor image, dominated by a Chilean team that barely had to make an effort," Marca said. "In the first half Vargas and Aranguiz showed the deficiencies of a team that is crying out for generational change," it added. "Vicente del Bosque's team could not give more in football nor physical fitness." Rival sports paper AS headlined: "Goodbye to the World Cup". 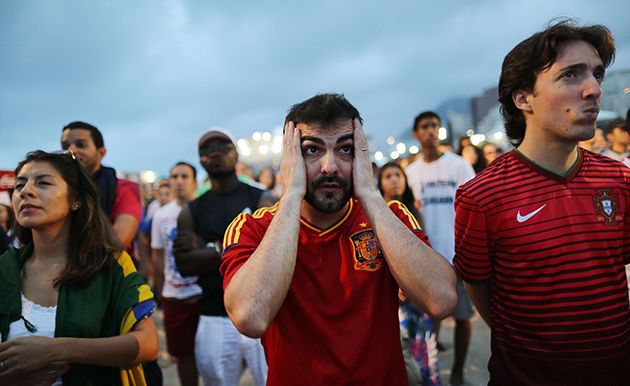 "Spain did not react and becomes the first team to be eliminated," it said. Back at the Madrid bar, some customers sought to take the pain off the defeat. "I am very disappointed. We were hoping for something else. We were hoping for a better game, a better attitude," said Angel Matia, a 34-year-old publicist. "Beer and the anisette we just had makes it a bit better," he added. "The problem? The truth is I don't know. I suppose we have forgotten how to play or we're physically tired." A miserable-looking fellow at the bar, 51-year-old sales manager Manuel Lista, was resigned to Spain's fate. "What do I feel? Sorrow, sorrow, nothing more. But it's normal. We did not play well. Spain are not in good shape and that's it. I love football and I saw it coming," Lista said. The Spain fan blamed Del Bosque for failing to bring in a new generation of players two years ago. "They have carried on with the same players and when they got to the World Cup they were out of shape. And the coach was not able to bring people in who were in better shape," Lista said. 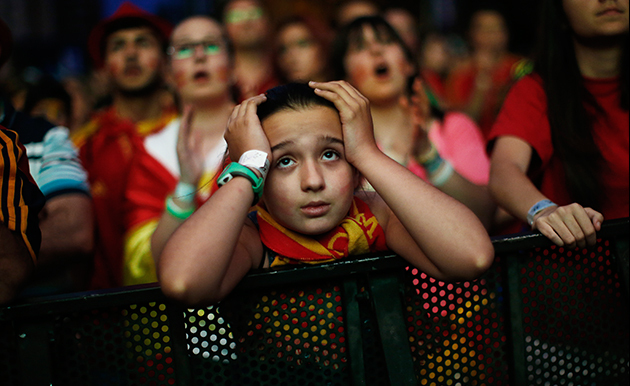 Dejected by Spain's performance, Lista had few expectations either for the country's new King Felipe VI, who took power at midnight just minutes after the national side's defeat. "Football and politics are two different things," Lista said. "I don't think Felipe or the old king can do anything beyond being good ambassadors for Spain around the world. The constitution does not give them more powers to do anything." Across the road in a packed sports bar decked out with multiple television screens, a waiter with a microphone tried to lift customers' spirits as the game unravelled. "Either we start crying like girls or we start cheering on the game," the waiter chided.